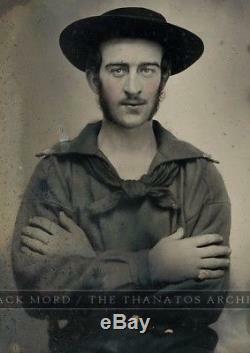 Rare original circa 1862 sixth-plate ambrotype of a sailor. The very tips of his collar are painted... To me it looks like the left one is gold and the right is silver. In addition, he is wearing a large gold pinky ring, and what I believe is a knife on his belt, also with painted gold accents. There is not much detail around that area, but based on the angle and placement of the gold, I'm pretty confident it's a knife. Housed in its full original case, 3.75" x 3.25" when closed. Ambrotype is behind glass an in very good condition overall. 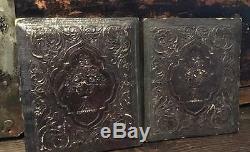 The covers of the case are separated along the spine. Soldier rare photograph tin type antique photo photography marine navy naval picture history historic 1860s uniform nbsp. 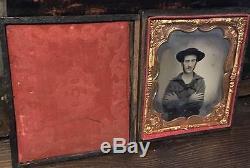 The item "Excellent 1/6 1860s Ambrotype Photo Civil War Navy Sailor Armed w Knife in Belt" is in sale since Sunday, September 9, 2018.